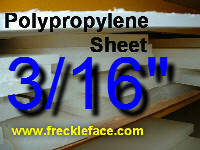 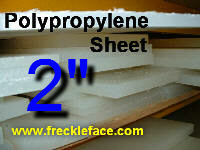 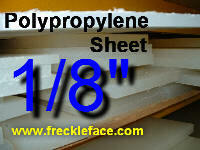 3/4 X 12 X 60 Polypropylene SheetNote: This can be relatively expensive to ship because it is considered oversize. 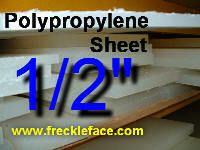 Consider multiple smaller pieces if you don't need it all in one piece. 3/4 X 36 X 36 Polypropylene SheetNote: This can be relatively expensive to ship because it is considered oversize. 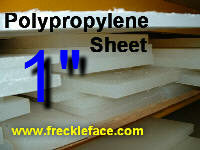 Consider multiple smaller pieces if you don't need it all in one piece. 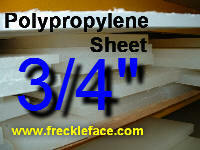 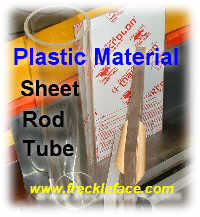 3/4 X 36 X 48 Polypropylene SheetNote: This can be relatively expensive to ship because it is considered oversize. 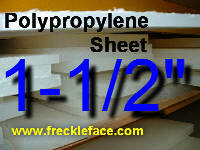 Consider multiple smaller pieces if you don't need it all in one piece. 3/4 X 5-1/8 X 12-11/16 Polypropylene Sheet. L & W Tolerance +/- 1/16"